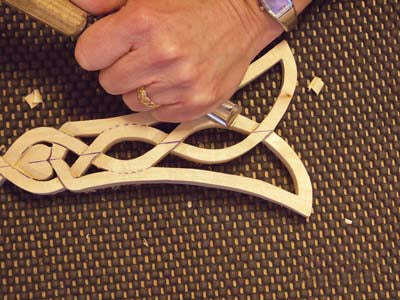 We offer you to learn to carve a traditional Celtic lovespoon in 20 steps – perfect for beginners. Let’s begin! Cut out the outside shape of the spoon. 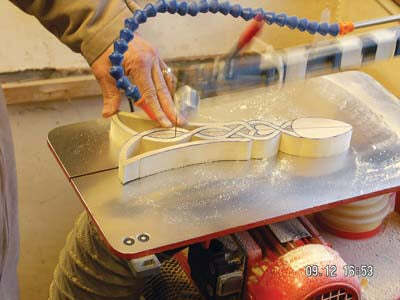 We offer to use a scrollsaw if you have one, in other case use a handheld coping saw. 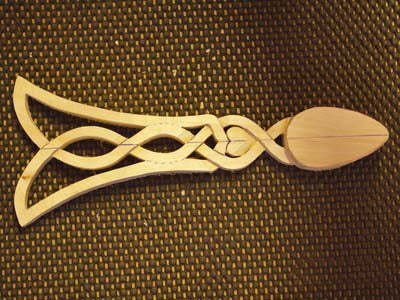 This lovespoon is a traditional Welsh custom, which dates back to the 17th century. The men gathered their creative talents and carved the decorative wooden spoons for a chosen lady as a symbol of love and affection. The custom still continues but nowadays it is used mostly to celebrate a number of family occasions such as engagements, marriages, christenings and anniversaries. 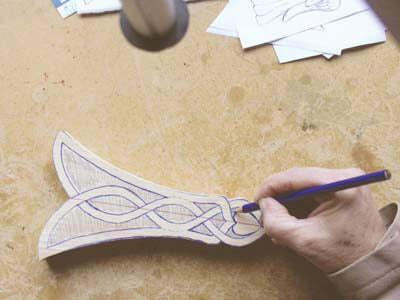 This project follows a simple step-by-step Celtic knot lovespoon to get you to know and show you how to carve the traditional tokens. 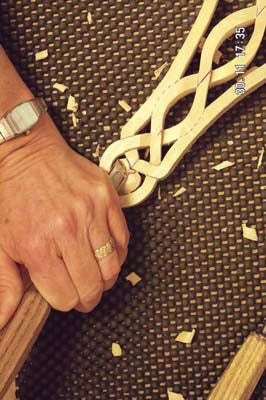 The Celtic knotwork consists of ‘unders’ and ‘overs’. Where a line continues over another, this is the over. The line that comes to an abrupt stop is the under, it is usually the ‘under’ line that is carved away first. Firstly, transfer the design to the wood. Remember also to copy over the center line, it will help to check that everything is aligned to the center. Hold your hand on the top half of the paper and slowly peel back the sheet to see if everything has been transferred. If not, let the sheet fall back into place and go over any missed sections and lines not easily seen. Cut out the outside shape the spoon. Use a scrollsaw if you have one. In other case use a handheld coping saw. Shade in the internal areas for removal as it easily identifies what needs to be cut out, and then please drill the shaded areas. 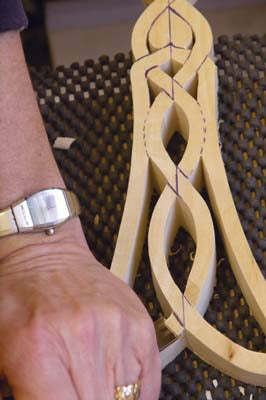 Remove the internal shaded areas by feeding the scrollsaw blade into the drilled hole and then proceed to cut it out. Repeat for each shaded section until the spoon is the same design as the drawing. Now you need to draw an outline along the side of the spoon to show what shape the finished spoon will be – this line is a guide only and can be changed as work progresses. Now it is time to begin carving! Please do not carve the back/underneath until the top of the spoon is finished. Remove wood down to the line marked along the side. Redraw the lines back onto the spoon that was removed when shaping took place, and then make a stab cut along the spoon bowl. Allow a tolerance line – this line will be removed when you have the correct levels/shape. 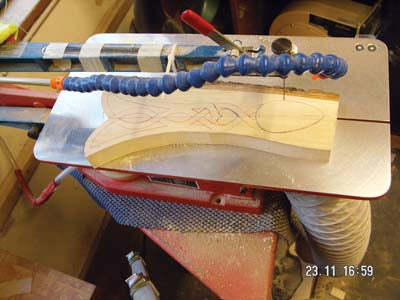 When you make a stab cut, ease pressure off as the chisel nears the baseline that is the line drawn on the side. In another case the unsightly cuts, if left, will look bad. Make stab cuts each side of the under/over lines and remove wood chips. Each cut will be angular and will need to be the same depth so that they look as if they will meet under the ‘over’ line. Then continue with the remaining under/over lines. Please don’t worry yet about the dotted line on outer edges. 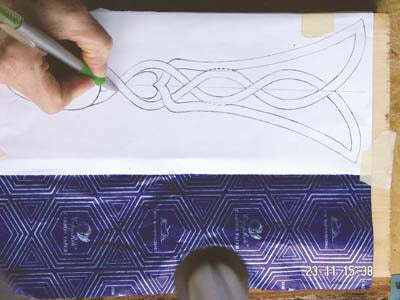 Now soften the angular lines once all the unders/overs have been cut, so that the Celtic knotwork appears as a nice continual and flowing line. These lines can be sloped over all the Celtic knotwork to give a camber effect. As you work on the under/overs where the heart is, remove wood at the base of the heart first, please don’t forget to stab cut. 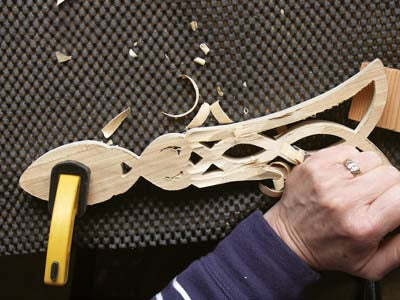 That it allows the ‘under’ cuts on the Celtic knotwork to be done and to stand proud of the heart. 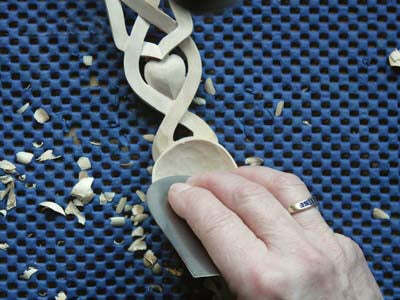 The heart is rounded to give a cushioned effect by changing the angle of the gouge to take more away from the top of the heart down towards the back of the spoon. 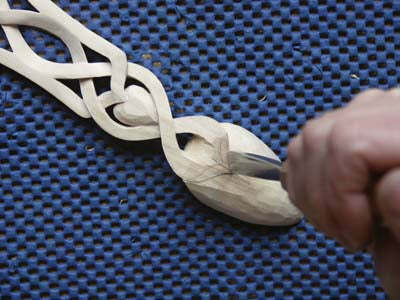 Be careful with the corner of the gouge, so that it won’t dig into the Celtic knot lines surrounding the heart. Now you are ready to shape the bowl. 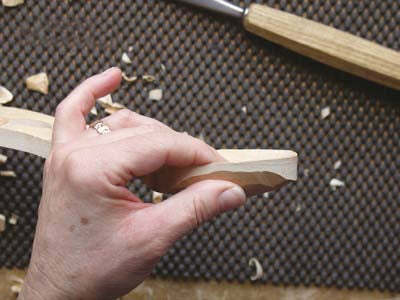 Firstly, remove the wood so that the top of the spoon follows the line drawn along the side. 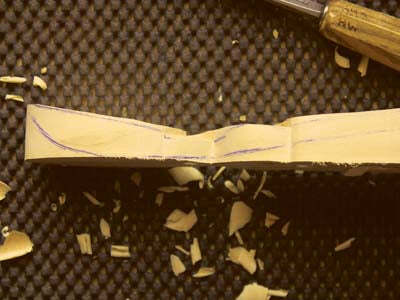 For hollowing out the bowl, draw a line approximately 2-3mm in from the edge of the bowl as a tolerance to reshape the bowl if the shape is not right. Please do not stab cut this line. Try to work with or across the grain. 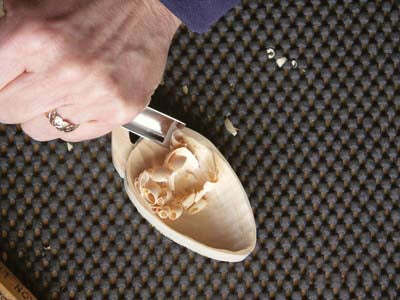 It would be better to use a long bent chisel for hollowing out the bowl. When satisfied with the overall shape, tidy up all areas that need it. Now we are going to begin to shape the back of the spoon. 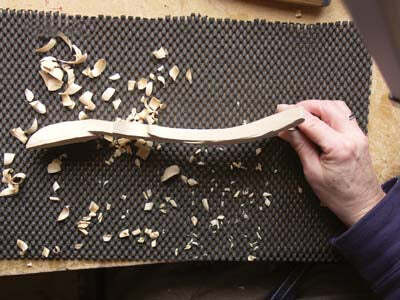 It is a great idea to use a clamp and some offcuts of wood for support under the curved areas as it will be difficult to carve, because the top surface, which now rests on the bench, is not flat. 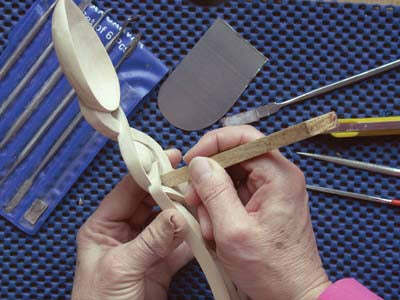 Not let’s start to shape the back of the spoon bowl – this is done in the same way as shaping the heart, i.e. 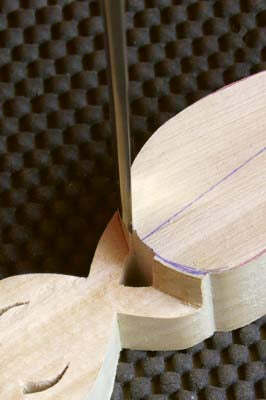 by changing the angles of the chisel to remove wood. Periodically it’s better to place your finger and thumb into the bowl so that you can gauge thickness of the remaining wood. Don’t remove any more if it’s getting thin. Once the back of the spoon is finished, it should look like this. Now let’s carve the back. 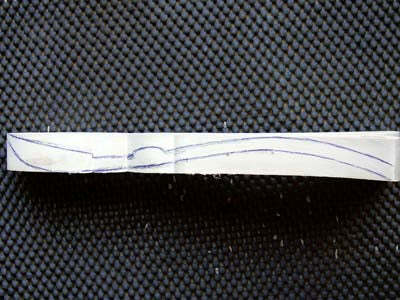 Draw, then carve the lines on the back of the spoon – remember the ‘over’ line on the top becomes an ‘under ‘on the bottom. We have also continued the shape of the Celtic knot onto the back of the bowl for added effect. Tidy up any unsightly cuts using a knife, chisel or scraper. The scraper is very useful in the bowl of the spoon. 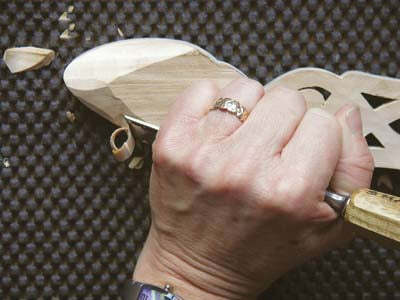 The next process is to sand the lovespoon. 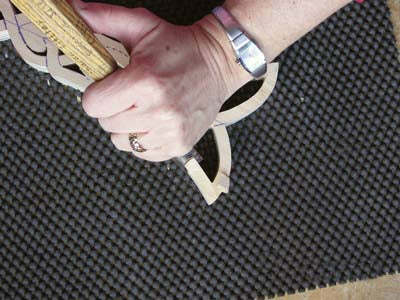 We should admit that not everyone likes a sanded finish so if you do not intend to sand, then the cuts need to be clean. If sanding, the crisp lines need to be maintained. In this case, it is a good idea to use double-sided Sellotape to stick sandpaper to offcuts of wood, wax modeling tools etc, so that consistent pressure could be applied. Please make sure internal areas are also sanded. The final two stages are to apply a sanding sealer to the whole area. Remember to get into nooks and crannies. This will raise the grain so allow to dry, then lightly sand once more using very fine sandpaper such as 600 grit. Finally, please apply a coat of wax, leave it for approximately one hour, and then rigorously buff off so that your finger glides over the finished surface.